Describe the pathophysiology of glaucoma and new imaging techniques and biomarkers of disease. Describe the latest advances in pharmacological and surgical treatments to manage glaucoma and the future goals of treatment. Monitor glaucoma patients and glaucoma suspects more effectively. Analyze OCT and VFT results more accurately. Diagnose and classify angle closure, angle closure suspect, and PACG. Provide better care to patients at risk for angle closure. Review key clinical features of common types of secondary open-angle glaucoma. Improve detection of secondary open-angle glaucoma based on history and clinical examination. Analyze the need for new drugs and technologies for medical management of glaucoma. Examine the mechanisms of action of IOP-lowering agents used to treat glaucoma in order to provide the most appropriate therapy. Assess professional readiness to participate in perisurgical glaucoma care. Offer pre-referral counsel to glaucoma patients. Differentiate normal tension from high tension glaucoma. Conduct an appropriate workup to diagnose normal tension glaucoma. Identify early glaucomatous damage on visual field based on established guideline for minimal glaucomatous defect. Properly stage glaucoma using the AGS severity scale. Select appropriate medical therapy for the individual patient by evaluating both the efficacy and safety of glaucoma drugs. Identify ocular perfusion pressure as a risk factor for glaucoma progression. Identify barriers to medication adherence among their patients. Take steps to reduce nonadherence among glaucoma patients in their practices. 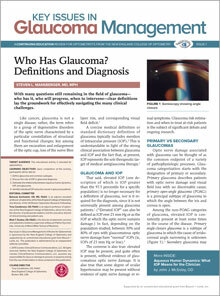 Define glaucoma and common subtypes. Discuss the role of IOP in glaucoma diagnosis. Delineate the relationship between aqueous humor dynamics, IOP, and glaucoma. Identify individual IOP reduction needs in glaucoma patients.